You've found the NEW Aviator gauge panel from Davis Haus of Style. I personally designed this panel with art deco influences in mind! This Super Deluxe gauge panel comes polished with REAL aluminum engine turned inserts. Designed with Classic instruments 3 3/8" and 2 1/8" gauges or Stewart Warner gauges in mind. 18" wide by 5.25" tall. Perfect for any flat dash. 1932 Ford closed car dash shown. 100% MADE IN THE USA. HIGH QUALITY HOT ROD PARTS BY THE WORKING MAN FOR THE WORKING MAN! Get yours today while supplies last! THESE WILL NOT LAST LONG! Used by top builders such as Roy Brizio and Von Franco! See my other listings for unpolished versions, or the "Deluxe" model (unpolished with engine turned inserts). The item "AVIATOR Gauge Panel 1932 Ford Model A Hot Rod Dash SCTA Super Deluxe Flathead V8" is in sale since Tuesday, October 17, 2017. 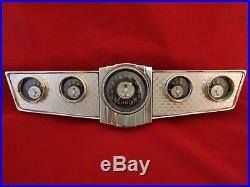 This item is in the category "eBay Motors\Parts & Accessories\Vintage Car & Truck Parts\Accessories". The seller is "pinstriper40" and is located in Florence, Colorado.